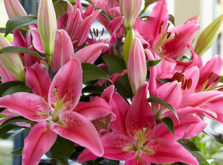 What if Lilies were pollen free? Our vision at G.A.Verdegaal is that this would offer a truly tremendous advantage for the consumer. We strongly believe that this is where future business lies for many countries. 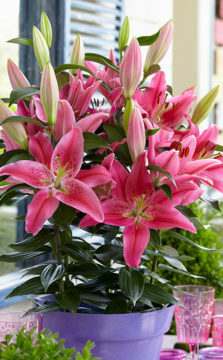 BEST REGARDS, a cut flower Oriental variety from our own hybridising line known as THE YOUNG ONEs is already in significant demand. This is but the first in a full range of pollen free varieties that will follow. Many of our Pot Oriental series THE ROMANTICs, completely surprise onlookers by their super-fast forcing times of only 9-10 weeks! Look out for Smart Romance and White Romance. Within our Pot Asiatic series THE JOYs we will be exhibiting some exciting new bi-colour and brush mark varieties as well as double-flowering pollen free. Look out for Panda Joy and Splendid Joy. Our format of planting and variety displays is unique. Visitors are able to see varieties in varying growth stages, alongside established commercial varieties. 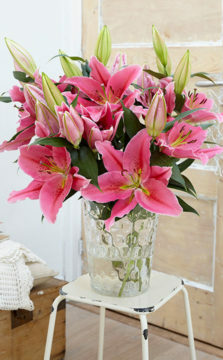 Come and be surprised at GAV Lilies, we look forward to welcoming you to our trial house.